You’ve seen them, you’ve taken them, you’ve loved them and loathed them. It’s that BuzzFeed style quiz that has taken over your Facebook newsfeed and promises to tell you what kind of Disney Princess you are if you’ll just answer a few short questions about your coffee preferences. They reel you in with the carrot of revealing something about your personality or intelligence, and before you know it you’ve not only taken the quiz in its entirety but are also now sharing your results on social media. It’s viral marketing at it’s best, and companies, entrepreneurs, and bloggers are using this strategy to grow their email lists like crazy. “If you want a lot of people to share something online, there has to be something personal, interesting, or fun about it… Most people love reading and hearing about themselves. You’ve heard you need to build your email list with freebies and checklists and resource files. And those can work great! But if you’re looking to try something a bit more fun and “out-of-the-box” that will both delight your audience and grow your email list at the same time, then I think you’re going to love creating an online quiz for your blog. I created my first quiz last month and it was so much fun! Well, not fun like having crazy dance parties with your kids, but wayyy more fun than creating ebooks. Want To Create Your Own Quiz Right Now? You can begin creating your quizzes immediately with an online quiz creator like Interact (this is the one I used). They have a fantastic tutorial and a bunch of examples and tips to help you create an awesome quiz. When I first heard about using online quizzes as a marketing strategy and list building tactic I was intrigued and excited to try it but, having a bazillion things on my blogging to-do list already, filed it away on my “someday” list of things to try. Make sure you create a “clickable” title and cover image that piques your ideal reader’s interest and makes them want to click. Here’s a screenshot of my quiz, and the simple addition of the word “actually” to make it pop a bit more. If you miss the mark on the title then your quiz is DOA (as is also the case with your blog post titles! ), so spend time brainstorming and coming up with one that’s great. The questions and answers inside your quiz are the heart of the quiz. They should be related to your blog topic and also lead the reader to take the ideal next step (sign up to your email list). The Interact quiz builder I used makes it really easy to set up questions and answers. Their quiz builder guides you through adding questions and multiple choice answers. You can also add pictures to spice things up (they have a bunch you can choose from for free). At this point, you’ve had fun creating a quiz that will delight your readers, but don’t forget about your ultimate objective of getting email subscribers! 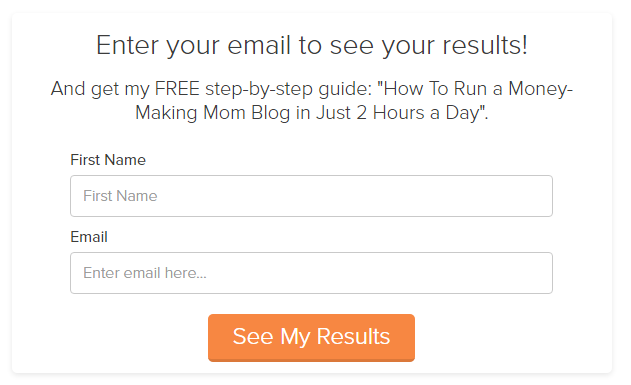 You can set it up so that people will have to give you their email address in order to see their results. 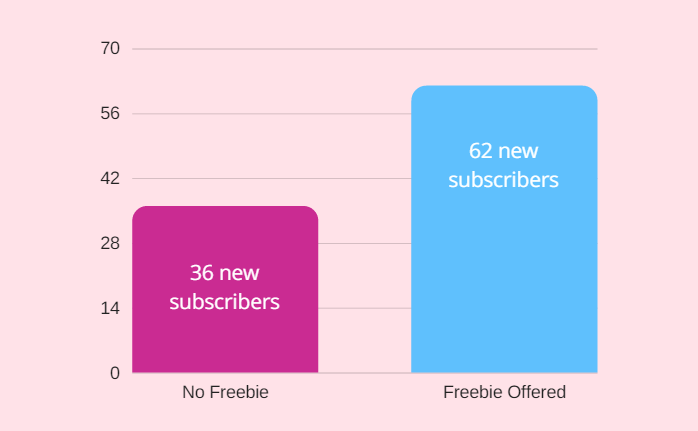 Pro Tip: Add a “freebie” offer at the end of the quiz to increase conversions. When I did this, it increased my email sign ups dramatically! The first week I promoted the quiz I got 36 new subscribers, which I was happy with. But after adding the freebie incentive, my promotion efforts after the second week increased 72%! The quiz builder integrates with most major email service providers (like MailChimp, ConvertKit, Aweber and many more), so connecting this with your email list is a breeze. This is the part I was most skeptical about because a lot of the quizzes I’ve taken online seem to have such random answers. Like the one I recently took on BuzzFeed titled, “Build A Starbucks Frappuccino And We’ll Tell You How Many Kids You’ll Have”… it said I had one. Ummmm, not even close. And even though I’d set up my questions and answers with specific results in mind, I was curious as to how the quiz builder would make it all work. Thankfully, it was really easy! They have a little tool that lets you easily correlate the answers with your desired result. Step #3: Publish & Promote! As I mentioned above, the entire setup – from brainstorming to creating all of the content – took me a few hours to complete. But I wasn’t done yet! Just like writing blog posts or any other type of content, you need to promote it to get the word out and readers in. Important Note: Don’t forget to welcome your new email subscribers with a strategic welcome email sequence. This will help ensure that your readers not only become subscribers, but also true fans that want to hear from you again and again. Trying to build your blog email list can sometimes feel like a chore. Somewhere between daunting downloads and overdone ebooks, we’ve lost some of the FUN in growing our blogs! If you’re feeling stuck – either from boredom or lack of results – I think you’re going to love creating an online quiz for your blog. If you enjoyed this post, will you please share it on social media? That 5-second gesture goes a long way to support my blog. Thank you! 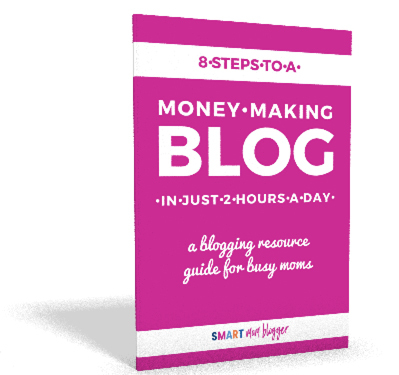 Everything you need to know, and in what order, to start and grow your own money-making blog in just 2 hours a day. Such a fun idea! I’ll have to give it a try. Thanks very much for sharing. Hey Nicole! Yeah, it was actually a lot of fun 🙂 Share the quiz link here if you decide to try it… I’d love to check it out! This is a great tool and your steps are easy but also so detailed thanks for sharing! You’re welcome Cacia! If you decide to create a quiz, feel free to leave a link here in the comments for everyone to check out! I’m convinced that I’m trying this. My teacher audience would love to find out what kind of teacher they are. They love memes too, so I could really make it fun. Thanks for the share! It’s really a great idea for collecting emails and probably this is one of the best utilization of quizzes. I am the spokesperson of Transcription Certification Institute and I love blogging. 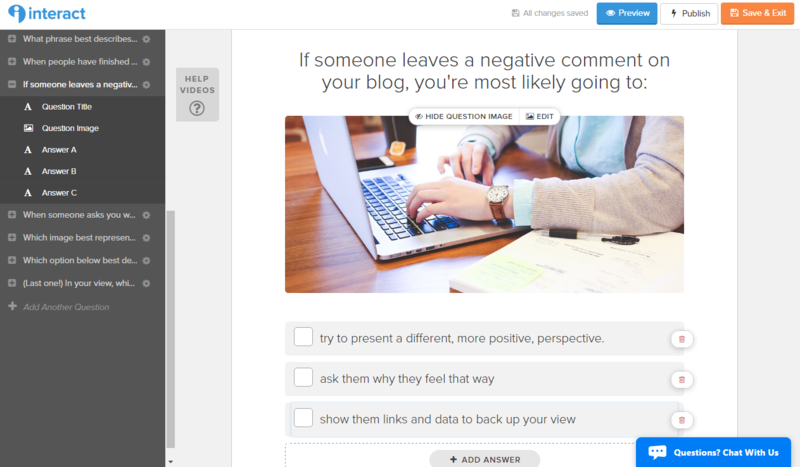 I’ve also started a quiz on my TCI blog to engage more audience and help them find answers to questions more logically. Currently, I am using Apester for creating the quiz. I also checked out Interact and it looks more usable to me. Anyway, thanks a lot for this great article. Thanks for the insight, Mahesh. 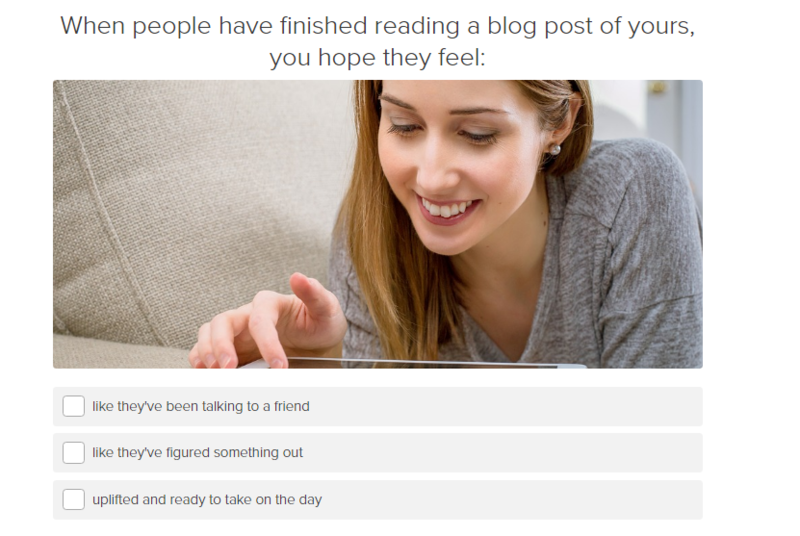 I think quizzes are great way to get readers engaged from the start and having fun with you/your brand from the get-go. And they really can be applied to any niche, as you’ve demonstrated with your transcription blog. Candis, quick question! Is Interact free or do you have to pay for the quizzes? If it is paid, do you think it is worth the price? Hi again Regina 🙂 – You can create and use quizzes for free, but if you want to be able to collect email addresses then there is a fee ($17/mo). For me, the email collection is the main purpose I’m using the quiz, so it made sense to use the paid version. I saw really great results with opt-ins for my quiz, so naturally, I highly recommend it, but I think it will come down to how effective your quiz is with your target audience. I’d recommend signing up for the free version and playing around with it to see if it’s something you can see working well with your readers. Once you sign up, they send you a super helpful tutorial on what makes a successful quiz and all the psychology that goes into it. 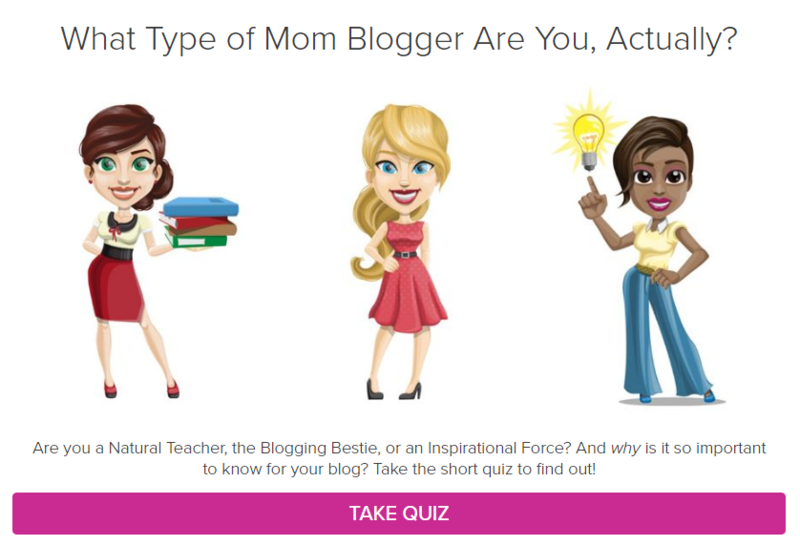 I used their emails/articles they sent after sign-up and just followed their instructions step-by-step to create a quiz I thought would resonate with my readers.